I reached into the fridge with one arm and unearthed some leftover avocado, tomato, hearts of palm, and artichoke hearts which I combined with red leaf lettuce, lemon, and olive oil. 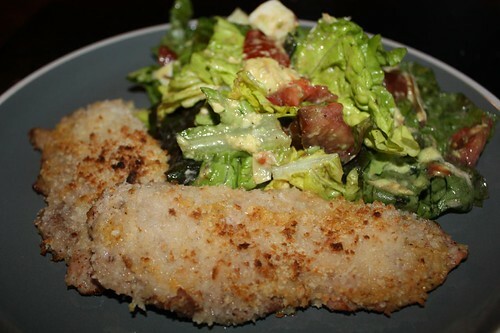 At the store I found some thinly cut pork sirloin steaks which I smeared with sweet-hot mustard and bread crumbs, seared, then finished in the oven. While it finished I poured out some of this wine. It's called Mingo. That's a ridiculous name. 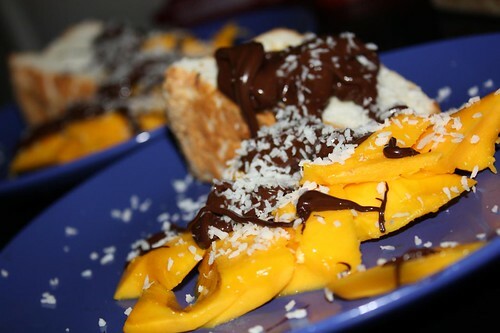 Jen had the idea to use some of her leftover angel food cake with mango, chocolate sauce, and coconut. I was skeptical. This was the opposite of every night where I try to make something and Jen is skeptical. Like Jen's skepticism mine was unfounded. It was quite good. With only 10 minutes spent on making dinner there's plenty of left to clean up the dishes in the kitchen. But how can we do dishes when there's a fresh new DVD of True Blood that came in? A shape-shifting dog? You've got to be kidding me! I can't imagine that I could ever assemble a salad, do something to a piece of meat and cook it, and get it all on a plate in 10 minutes. It would take me at least 30 minutes, Rachael Ray! It wasn't much. I barely even needed to use a knife! Cleaning the dishes was another story.